One of the uglier sides of empire has been the general treatment that the Commonwealth nations, especially Canada and Australia, received at the hands of Britain in regard to the operations of their native contingents during WWI and WWII. Many Canadians and Australians to this day will not forget (and in some cases forgive) Britain for the senseless loss of life among their troops during the First World War in places such as Vimy Ridge and Gallipoli, or the loss of more in the Second World War at Dieppe and Crete. This book highlights the measures taken during WWII by Britain to provide equipment to its Commonwealth brethren and how poorly they were really served by the "Mother Country." In 1940, Canada, like its US neighbor, began to gear up for full-scale war. Canada at that time enjoyed many of the same advantages as the US, namely being located too far from most enemy or prospective enemy nations to suffer damage to their infrastructure, most importantly industry. Canada had many factories which were either satellites of US companies or affiliated with them, most notably Ford and Chevrolet/GM Canada. When Canada began to gear up, they also immediately began to mobilize and send troops to England to defend against the Germans. But their first unit, the 1st Canadian Infantry Division, arrived in the UK short of most material and found that the British Army was also woefully short, and did not have anything to share. Many WWI weapons were dug out of mothballs, such as the SMLE Mark III and Ross rifles. Even then it was difficult to get supplies to the troops. The worst problem appeared to be the arcane method of allocation set up by Britain. Even after the US and UK signed the Lend-Lease agreements, the UK had final say on allocation of weapons and equipment, and picked which units were equipped and in what order. One problem appears to have been a British Purchasing Commission problem that today would be called NIH – "not invented here" as they were iffy as to the ability of the US and Canada to build equipment to British standards. Things were at times nearly comical in a "Keystone Kops" vein. The Canadian 1st Infantry Division was rushed to France in early June 1940, only to be turned around and sent back to England during Dunkirk but minus all of the heavy weapons and kit they had painfully managed to accumulate. They also found themselves low on the priority list for replacement items; as a point of fact, even though they had been stripped out by Dunkirk and were missing everything larger than small arms. the newly-arrived Canadian 2nd Infantry Division (which supplied the troops used at Dieppe in 1942) got higher priority for supply. Things were always problematical. One fly in the ointment was the fact that the Canadian CMHQ wanted its troops to be at least partially fitted out with Canadian-produced material, which became difficult with the British setting the allocation priorities for supply. There were literally cases of hundreds of Ford and Chevrolet CMP trucks coming in to the UK – only to go to either British units or the Middle East and the Canadian units being stuck with whatever prewar vehicles they could scrounge up, such as the Beaverette armored reconnaissance car. In the end the Canadians fielded five full divisions (1st, 2nd and 3rd Infantry Divisions and the 4th and 5th Armoured Divisions) plus corps troops and other separate formations. Their equipment was generally British pattern with a few Canadian touches – mostly the superior Ford and Chevrolet trucks from Canada as well as the best Commonwealth-produced SP gun of the war, the Sexton, which combined the chassis of the Canadian Ram cruiser tank with the 25-pounder. 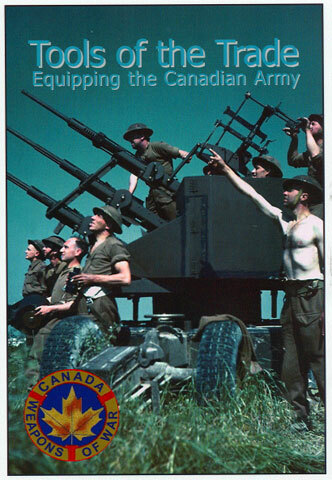 This book is a handy book of what the Canadians did get to use in the Second World War, and from how and where it was obtained. The text is very readable, and most of the information is quite useful. Modelers will be disappointed as there is little for them, however, as most items are only covered in passing and there are no plans or colors discussed. I have heard from other reviewers that there are some errors in the text regarding numbers of items such as Crusader tanks, I do not have good sources to check this out. There is at least one glaring error in photograph identification: on page 33 is a weapon identified as a Vickers "K" type machine gun; it is not, as it is a stripped down American Lewis gun like those used in WWI aircraft mounts without the cooling fins or barrel jacket. Overall, those are quibbles, as the amount of information presented is large and the coverage is very good. The Canadian War Museum in Ottawa could do worse than to offer this book as a guide to WWII Canadian forces, as it would be hard to beat.